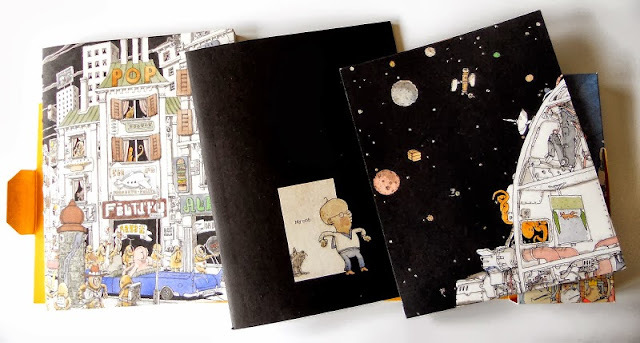 Comics&Cola: Mattias Adolfsson's Second in Line: pre-order now! 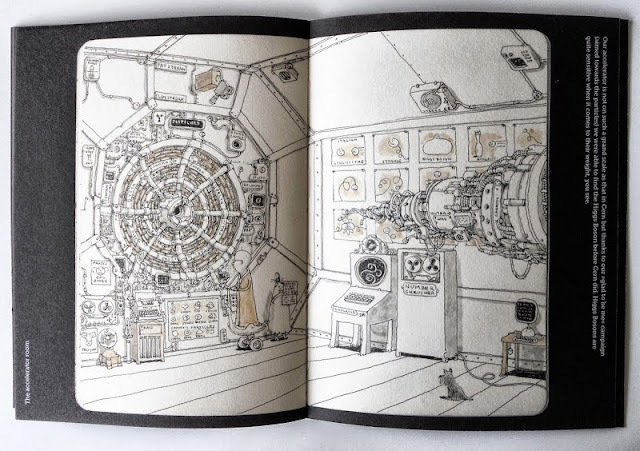 Mattias Adolfsson's Second in Line: pre-order now! Is it okay to start thinking about Christmas yet? 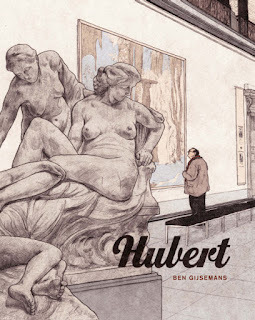 I'm going to hit you with a Christmas comics gift guide early in November, but you may also want to bookmark this beauty here. 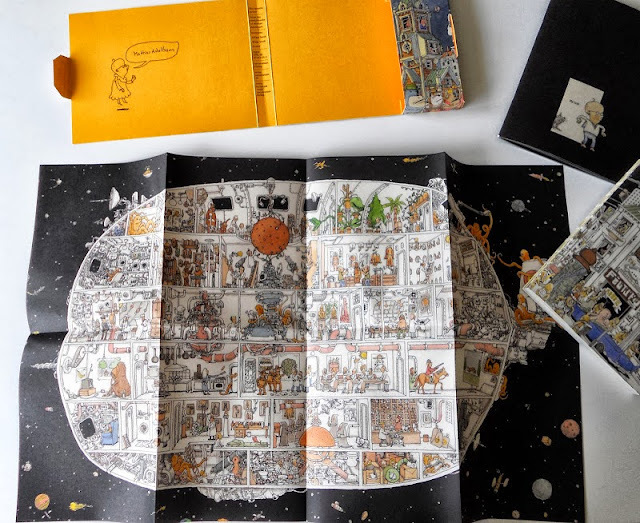 It's brilliant Swedish artist Mattias Adolfsson's follow up to his book First in Line, which was the first collection of his incredibly detailed, hand drawn illustrations. 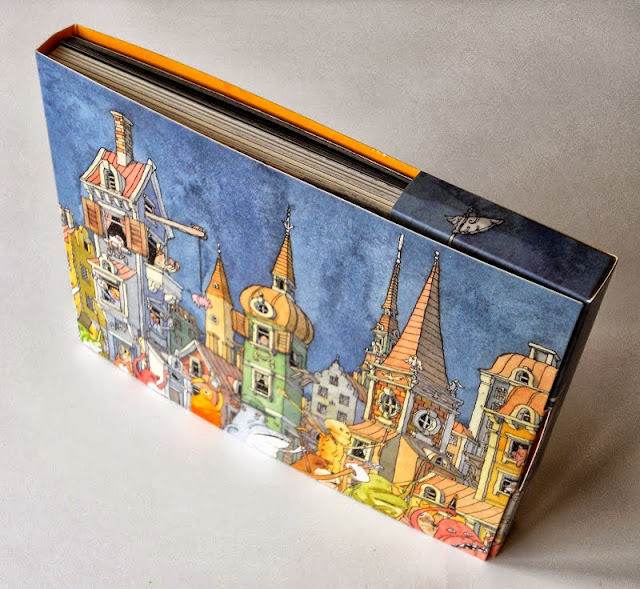 That quickly went out of print (much to my friend Andy's chagrin), but now Adolfsson is releasing another collection, Second in Line, with Santorium Publishing. If you're yet to come across his work, Adolffson draws minutely intricate water-coloured vistas, filled with quirky, serious animals and robots, all manner of curiously alive architecture and buildings, space shuttles. They remind me of the fantastic Usborne Puzzle books I read as a kid, which had an interactive narrative 'Mandy and Ben must find Aunt Beatrice to warn her about the thieves- can you help them find her in the crowded market place?' I loved those books. Adolfsson's illustrations have no written narrative, but there's so much story going on in each picture- you could look at it again and again and discover something new each time. Where First in Line was a traditional smaller landscape format book, Second in Line plays with format a little more, with 3 small books and a poster enclosed within a slipcase. The book releases on November 7th and all order are posted out on the 8th. At £20 odd pounds (inclusive of shipping) it's perhaps a little pricey, but as an owner of the first collection, I can attest to it being value for money. I think this multi-book, slipcased edition makes it a better gift; books are fantastic- I love books, but this seems more substantial somehow; I can imagine receiving something like this is a different feeling. Pre-orders come with a signature, sketch and a badge. You can order it here.